Your kitchen cabinet hardware is one of the things in your kitchen that is upgradable without spending a fortune. Many people have come to us here at RTA Cabinet Store over the years asking about stability, quality and lifespan of the RTA cabinets we proudly sell. While they are the best lifespans in the business, they can be upgraded even further by using different cabinet hardware. Well, one of the greatest things and the worst things about the cabinets we sell is that they are super stable and last for a very long time. This is great, as the value for your money is very high, but for some people who wait for things to wear out before they replace them, they wait for a VERY long time. Oftentimes our clients want something that will last a lifetime, and we aim to please. This is where specialized door hardware comes in. The most important accessories you can put on your doors are soft close door dampers, soft close upswing hinges for cabinets that open upwards, and soft close drawer glides for drawers. The biggest enemy of cabinets is not getting wet, time, etc., but human interaction. Especially if it’s a household with kids, cabinets and drawers get slammed. Even adults, when in a bad mood or in a hurry are guilty of this. Each time a drawer or door is slammed, while it doesn’t seem to do any damage, there is a tiny bit. That builds up over time, and can jar the cabinets, the frame, the door and the hardware. We want to avoid this. Check out the lines of door closing hardware here: https://www.rtacabinetstore.com/RTA-Kitchen-Cabinet-Accessories/. What Does the Soft Close Hardware Do? Basically, the soft close hardware makes it so you cannot slam your RTA cabinets and drawers closed. They have automatic cushions that break the momentum of the door before the point of impact, and they are very sturdy versions of closing hardware, designed to take a lifetime of abuse. This means that all the damage that could be done to your cabinets is mitigated, and even if something fails after many years, it’s going to be a cheap soft close dampener rather than the cabinet or its frame. It’s a small expense that will increase the life of your cabinets and, incidentally, reduce the noise pollution in your kitchen significantly. There are other small benefits as well, such as drawers not slamming and keeping everything where you placed it, your utensils drawer staying neat and organized, etc. It might not seem like much on a day to day basis, but think of the amount of damage you will save over the course of 10 years. Go ahead and give us a call at 1 (610) 337-5934 to get started! Or, you can get help today with a free kitchen design consultation by one of RTA Cabinet Store’s professionally trained designers. Just go to https://www.rtacabinetstore.com/free-kitchen-design-help. 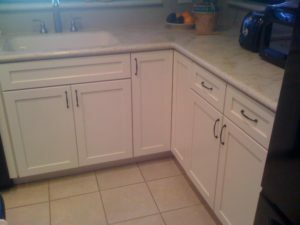 ‹ Can I Replace Just One Kitchen Cabinet?